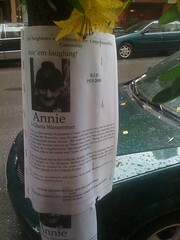 Jenn Pelly Notices about the death of Ms. Wasserman, also known as Annie, were posted this weekend along East Fourth Street. Gloria Wasserman, who sold newspapers at the Fulton Fish Market for decades and became a fixture in the East Village known and beloved as “Annie,” died last Wednesday morning at her daughter’s home in Los Angeles, friends and neighbors said. She was 85. “To say that Annie was a colorful character would be quite an understatement,” Felton Davis, a volunteer at The Catholic Worker who knew Ms. Wasserman for 20 years, wrote in an email this afternoon. Mr. Davis noted that Ms. Wasserman’s status as a neighborhood icon had received city wide notice in newspaper columns. When the fish market relocated to the Bronx in 2005, Mr. Davis said, Ms. Wasserman found it hard to adjust. In recent years, he said, she retreated to embrace of friends and neighbors around her apartment on East Fourth Street between the Bowery and Second Avenue. And she could usually be found near the comedy club where she would sometimes launch into what friends and neighbors described as impromptu comedy routines. Ms. Wasserman often spent time at the Catholic Worker’s Maryhouse on East Third Street, where she was a regular customer at the Saturday clothing room, and over the past year began regularly coming for dinner and sharing life stories. Among the most famous was the tale of how she bicycled from New York to Fairbanks, Alaska in three months in the 1940s. And almost everyone knew Ms. Wasserman’s day-to-day schedule, which involved arriving at the Fulton Fish Market every morning at 4 a.m.
And along the stretches of Third and Fourth Streets where Ms. Wasserman made her home, friends recalled her easy manner and often bawdy sense of humor. Mr. Davis described Ms. Wasserman as “fiercely independent” — a trait that she maintained even as her health began to decline over the past year. Mr. Davis said that Ms. Wasserman suffered a stroke in August and was taken to Bellevue, where she stayed for one month before eventually ending up with her family in Los Angeles. While Ms. Wasserman was in Bellevue, Mr. Davis got to know her daughter Barbara L. Fleck, of Los Angeles, and her daughter-in-law, Barbara G. Beaulieu, of Hudson, N.H.
“They were surprised to learn that no one in New York actually knew her by her real name,” Mr. Davis said. 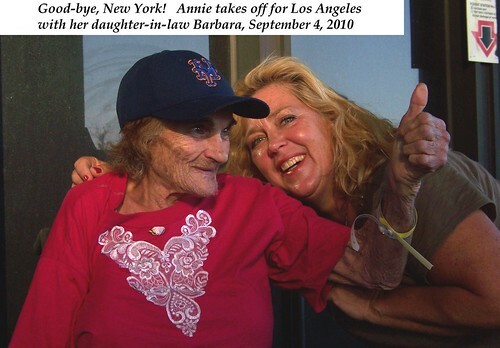 Courtesy Felton Davis Gloria Wasserman, 85, the East Village fixture who was known to many as Annie, with her daughter-in-law Barbara G. Beaulieu as she prepared to leave New York for Los Angeles earlier this month.